I See. I Eat. I Do. 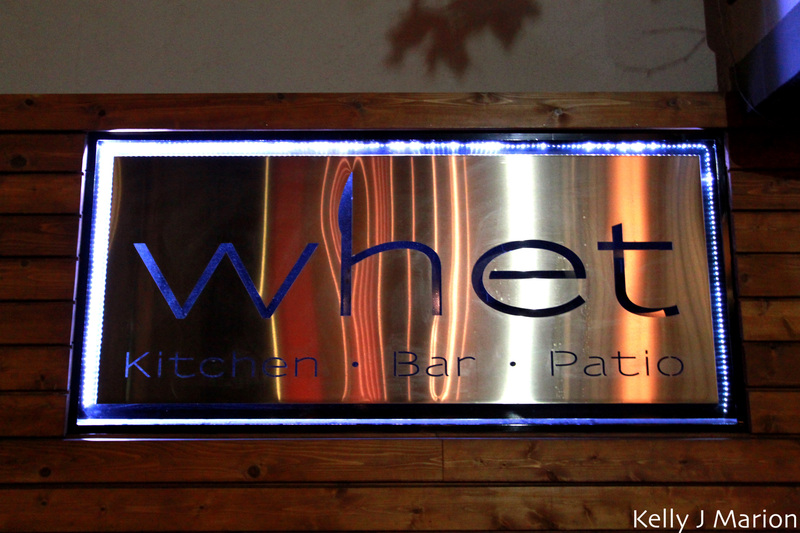 Where there was once a Sammy J Peppers, there is now Whet Kitchen and Bar. This upgrade was an important one for Granville Island, as this restaurant better represents what the area is all about: fresh, local and sustainable. Chef Peter Gray, like more and more Chefs these days, is in full support of the slow food movement and the idea of knowing where food comes from, from farm to fork. To highlight some of Whet’s local dishes, General Manager Raashil and Chef Peter Gray teamed up with the VANEATS team to create a “tasting package” where for an affordable price you can try a variety of items. Curious to revisit the restaurant as I have only been there for beers to sit on their fantastic patio (shown below), I decided to test the Whet Your Appetite package out. The meal starts with a Coconut Scallop Ceviche with hand peeled shrimp from Tofino, citrus juices, ginger, jalapeno, corn chips, tobiko and ikura. This is a very nontraditional ceviche (as I was explained many times) but it was still hard for me to not compare it to the mind-blowing ceviche I had in Tulum last fall. The coconut flavour is mild in the creamy but light sauce but tones down the prevalent pineapple and lime juices which make up the rest of the sauce. The corn chips are freshly made and create a nice way to scoop up the juicy, dish. I’m not a huge shrimp fan so masked them with sauce, grapefruit (a nice palate cleanser) and chips but loved the chunks of scallop, appreciating the fact that they are “Sashimi Grade”, which means that they are caught by individual handline. Don’t eat this thinking that you won’t make a mess as you’ll most likely be licking the sauce of your fingers, or as my friend did, wiping it off of your lap. At the same time as I had the ceviche I sampled the Prawn, Shrimp and Wild Mushroom Salad with pan-seared prawns, wild local mushrooms, hand peeled shrimp, arugula, grapefruit, taro root crisps and a lemon-hazelnut vinaigrette. This was my favorite dish out of the three largely because the vinaigrette really is as Chef Peter Gray explains it, “fantastic”. It is zesty and bold, coating the arugula and proving it superior to many mild types of vinaigrette that pack no punch at all. The taro root crisps are fairly flavorless as taro tends to be but add the crunchy textural component that the dish needs. The mushrooms were also a standout, sauteed to perfection and having a buttery taste to them. The prawns were plump and juicy, making me wish that I could omit the shrimp and have more than two prawns. I was a little disappointed by my entrée choice of the Red Honey-Curry Coho. This dish conisisted of Wild BC Coho, saffron yoghurt, hot pickled lime puree, candied almonds, dates, yam chips and cinnamon market vegetable, which when I went happened to be broccolini. This dish is Chef Peter Gray’s personal play on tandoori. I was hoping for a little more honey essence in the dish, to have the sweet and spicy flavour that the name implies. Instead I tasted a chalky paste that didn’t flavour the salmon but rather sat on top of it. Eaten alone the salmon for me was not something I’d order again but it was saved slightly by the accompaniments, as the broccolini was cooked just right, the dates were sweet and delicious, and the saffron yoghurt and lime puree were tasty. The two sleeves of Angry Scotch Ale from Russell Brewing Company was an interesting choice for the collective meal. Considering that this is a seafood-based meal (unless you opt for the duck confit as your entree) you would think a glass of white wine may be more suitable. That said, despite the beer being a strong, dark, ale with a dominant malt accent and a smoky mouthful, it is still a good beer enabling one to forgive the “improper pairing” and drink it with the meal, or, as I recommend, having it before the meal. For more photos check out my WHET SET on Flickr. Whet Your Appetite is already on sale on the VANEATS.ca website for $30/package until they sell out. Passes can be redeemed until January 17th, 2013. Disclosure: I was provided with one complimentary dining pass for the purposes of reviewing the package, courtesy of VANEATS.ca. All opinions stated are my own. Want more? Subscribe then silly!